Composer Augusta Read Thomas, with cellist Lynn Harrell (left) and conductor Christoph Eschenbach, was called to the stage several times. This attention to minute detail is a hallmark of Thomas’s music and reflects the delicacy of imagination with which she constructs her sound worlds. 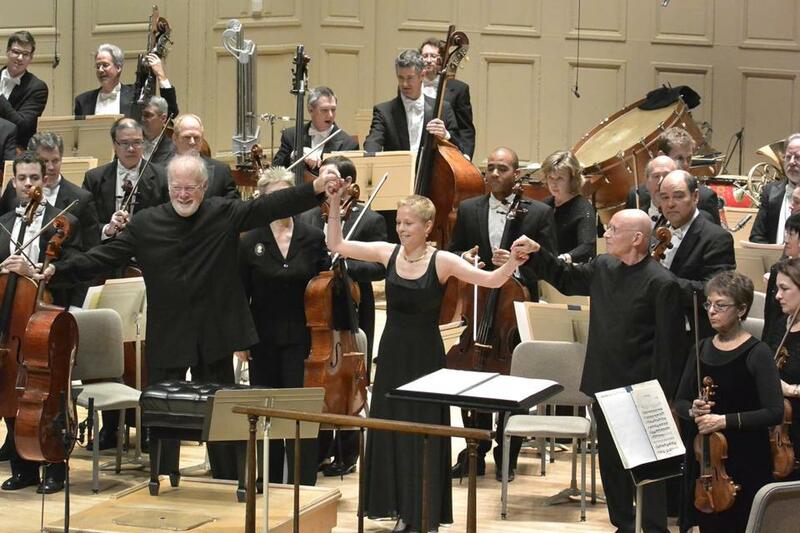 That this new work, a BSO commission, also contains a vivid theatricality of gesture, a certain lightness of being, makes it particularly successful. Despite its subtitle “Legend of the Phoenix,” the work has no explicit narrative but unfolds in a single 30-minute span that divides into coherent sections. The first is full of expansively songful cello writing, with the brass on occasion interjecting fractured, flash-mob fanfares, appearing from nowhere and disappearing nearly as fast. The solo writing eventually gathers speed and angularity and the rhythms grow more jazzy before the cello takes us into a hazier, dreamier landscape. There is a vibrant pizzicato section and some ruggedly expressive solo cadenzas in the final pages. The work comes full circle, ending as it began with a high blast from the cello. On Thursday night cellist Lynn Harrell gave an assured and virtuosic performance, rendering the score’s more declarative moments with the same unflagging confidence he brings to Romantic solo repertoire. From the podium, Christoph Eschenbach, who has performed much of Thomas’s music, drew out an alert and vivid performance. The crowd’s reception went well beyond the polite applause sometimes given to new scores. Eschenbach chose to surround the premiere with popular symphonic staples, opening the night with an intermittently unsettled performance of Mozart’s “Jupiter” Symphony and closing it with Saint-Saens’s massive “Organ” Symphony. Despite some moments when the latter work seemed to bog down beneath Eschenbach’s deeply felt sentiment, this performance had on its side the majestic Symphony Hall organ and the superb French organist Olivier Latry. Eschenbach and the orchestra did not stint on the music’s climaxes and the ovation after the final chord was immediate and robust.